The beauty of short yoga practices is that you can fit them into small pockets of your day much more easily than a full-length yoga practice. This means that you can use those “yoga snacks” as a first line of defense against physical tension – as soon as tension shows up, or even before it happens. For example, if you know that your hips get tight by lunch time, doing some work with your hip flexors mid-morning can prevent it from happening. This short yoga practice for hip flexors is meant to loosen up your hips by contracting and stretching your hip flexors. This can have a positive effect on your lower back as well, since hip flexor tightness is often connected to lower back pain. 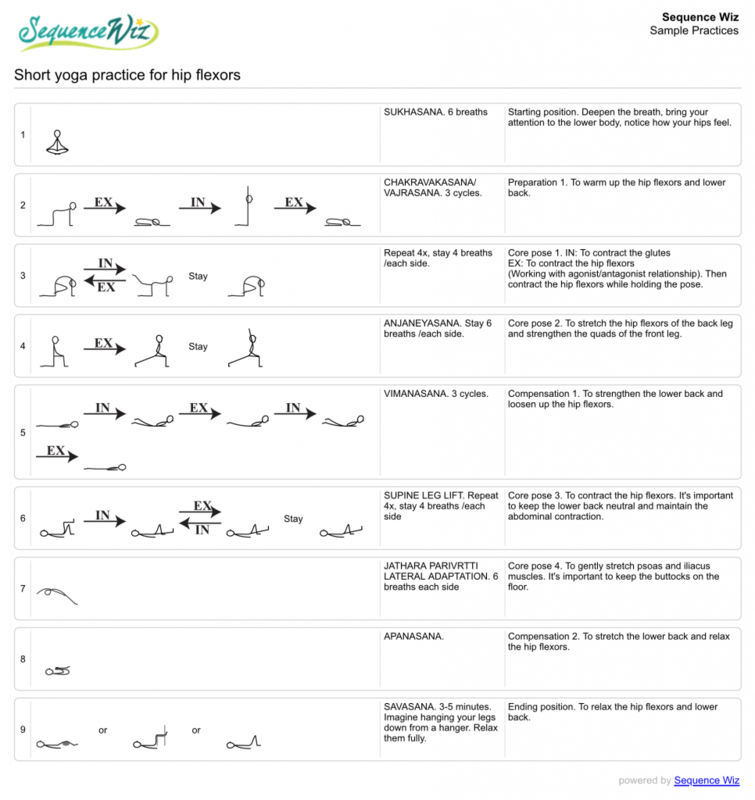 The structure of this practice follows the template for short yoga practices that we’ve outlined last week. Doing it several times a week will have a more pronounced compound effect. Please give it a try and let us know how it goes! I have a question on the instructions for the half leg lifts at about minute 10…can you tell me why is the instruction to keep a neutral back and have a little space between the lower back and the floor? In an effort to teach people to not arch their backs (use the muscles in their backs when they should be using their core)…I have been telling them to “press their lower backs into the floor” . If there is a reason this is incorrect, I should know so I can change it. thanks for your wonderful mini vinyasas! they are always insightful. Hi Cherie, thank you for your comment and your excellent question! Here is how I approach this (and other teachers might have other ideas). I asked you to keep the neutral lower back because in my experience it makes you engage your core all around while at the same time working your hip flexors, which I find very beneficial. However, for those folks who have trouble preventing the pelvis from tipping forward when they lift the leg up (and beginners in general), it is safer to press their lower backs into the floor on that movement. In fact, sometimes we even hug the bent knee to the chest to facilitate the lower-back-against the floor idea. So neither way is wrong, it’s just appropriate for different situations and different students and kind of relates to the whole idea of whether to tuck or not to tuck the tailbone under. If you try it both ways yourself, you will likely get a different feeling and different muscular activation with those two options. I hope this makes sense! I have a question about one of the movement wich is more or less bizzarely not possible for me : on the 2. of the sequence, when you do the second part of the mouvement – you get up on the knee rising the arms in front then you go down putting the torso on the upperlegs. I manage to rise with the arms in front, but when I go back with the torso on the knee I just can’t keep my arms in front of me, it is like if I get stuck in the middle of the way more or less. I have to put them on the floor or on my back to be able to continue to put the torso on my leg. It is difficult to explain… I don’t have this problem in the usual “magic” movement. Hi Emmi, thank you for your comment! When you attempt to move down in Vajrasana with your arms extended and “get stuck”, can you feel where the limitation is coming from? The knees? The back? The hips? It might be interesting to explore. Sometimes it can be just individual body proportions that prevent you from folding down like that, but usually I would observe students tipping forward on the way down, not getting stuck. The bottom line is that this movement is not critical to the sequence, so if it’s not happening for you – no big deal, just put your hands down first or place them on your back, as usual. You can also try keeping the arms out to the sides and see if that makes a difference. Hope this helps! Hello Olga, thanks for your answer. I was exploring a bit the movement and it is actually quite funny. 😉 It is like at one point, more or less a bit before halfway, I would fall in front if I go further in folding. as soon as I put my arms on the side or better on my back it is ok. I don’t really feel limitation neither in the knees back or hips – except maybe that my bottock never touch the feet, like when I’m in “child pose” – so this might be the limitation. I know i have a quite long torso, short legs and relatively short arms (sitting with the leg in front of me, I can’t put my hands on the ground with the palm flat next to me sitting upright). Great to know that in this sequence it is not so important to do it in this way. But I remember another sequence, targeting more the upperback and shoulder and neck, with the same movement but with only one arm –> not possible neither for me! Hi Olga I’ve just done this lovely targeted practice and want to tell you how much I enjoyed using the visualisation of hanging from my knees to open the hips further at the end! 💕 My body is SO happy now! Next story Would you like to feel more energetic and powerful?